At a conference attended by the representatives of over 700 RWAs across Delhi, before the Delhi Assembly Elections, former chief minister and AAP convenor, Mr Arvind Kejriwal ( now the CM of Delhi ), had announced his party's stand on "RWAs empowerment vision plan" covering the RWA ACT , EMPOWERMENT OF RWAs , STREAMLINING OF RWA FUNCTIONING etc. The Aam Aadmi Party on Saturday unveiled its citizens empowerment plan at the conference of the Resident Welfare Associations in the national capital. 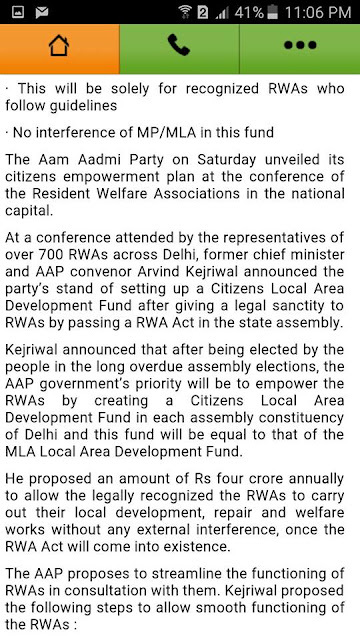 At a conference attended by the representatives of over 700 RWAs across Delhi, former chief minister and AAP convenor Arvind Kejriwal announced the party’s stand of setting up a Citizens Local Area Development Fund after giving a legal sanctity to RWAs by passing a RWA Act in the state assembly. Kejriwal announced that after being elected by the people in the long overdue assembly elections, the AAP government’s priority will be to empower the RWAs by creating a Citizens Local Area Development Fund in each assembly constituency of Delhi and this fund will be equal to that of the MLA Local Area Development Fund. He proposed an amount of Rs four crore annually to allow the legally recognized the RWAs to carry out their local development, repair and welfare works without any external interference, once the RWA Act will come into existence. 1) There should be only be a single RWA in a locality. 2) It should be registered. 3) It should have free and fair elections at regular intervals as per its constitution. 4) As a part of this exercise, it is proposed that the RWA will have a GBM of all its members on a fixed day and time every month. All important decisions shall be taken in the GBM by the residents. RWA shall be responsible for subsequently implementing those decisions. 5) The accounts of RWA shall be transparent and available for public inspection. They shall be annually audited and presented to the GBM. There shall be social audit of accounts at regular intervals. 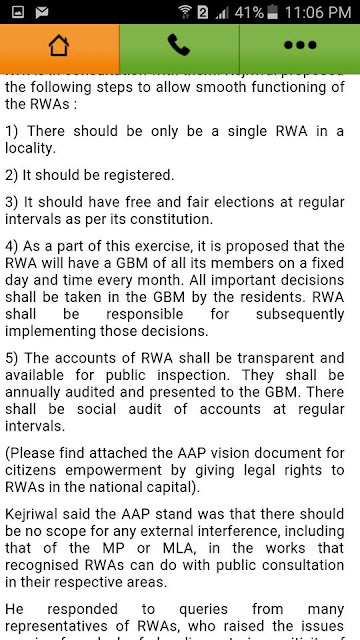 (Please find attached the AAP vision document for citizens empowerment by giving legal rights to RWAs in the national capital). Kejriwal said the AAP stand was that there should be no scope for any external interference, including that of the MP or MLA, in the works that recognised RWAs can do with public consultation in their respective areas. He responded to queries from many representatives of RWAs, who raised the issues ranging from lack of cleanliness to insensitivity of civic bodies, mainly the Municipal Corporation of Delhi, in addressing the RWAs concerns. RWA representatives demanded regular interactions with the AAP leadership, particularly in presence of Kejriwal, to which he agreed. The AAP also announced the setting-up of its RWA Wing on the occasion. 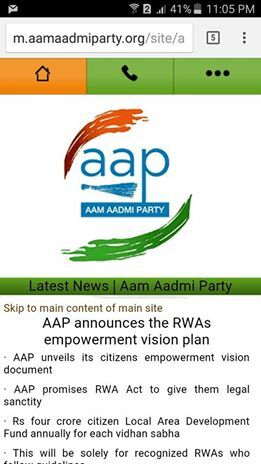 Pandav Nagar RWA vice-president Ratnesh Gupta will head the AAP RWA wing and will coordinate with the various RWAs of the city to apprise them of the initiatives being taken on this front. 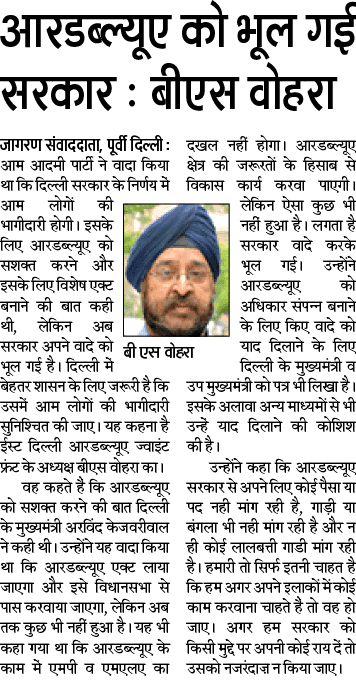 Aam Aadmi Party won Delhi assembly elections with a massive mandate, but nothing as mentioned above, happened anywhere. 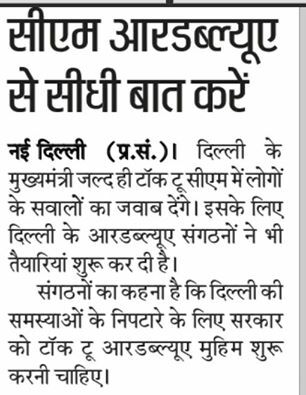 No RWAs Act, No Empowerment of RWAs, No Streamlining of RWAs Functioning, instead, we the RWAs are being sidelined, by introducing his own Mohalla Sabha. B S Vohra through his 'RWABhagidari' Network of RWAs has taken the initiative to remind Mr Arvind Kejriwal, about the promises, that he had made with the RWAs of Delhi, before becoming the CM of Delhi. You too can join this movement.